Planning a wedding or large event isn’t easy. In fact, it shouldn’t be! If it was, there wouldn’t be a need for certified professionals at all! But no matter how much you prepare ahead, Murphy’s Law is always looming in the background. So if something terrible can happen no matter how much you plan, what can you do? Well, planning to prevent disasters and planning to resolve them go hand-in-hand. 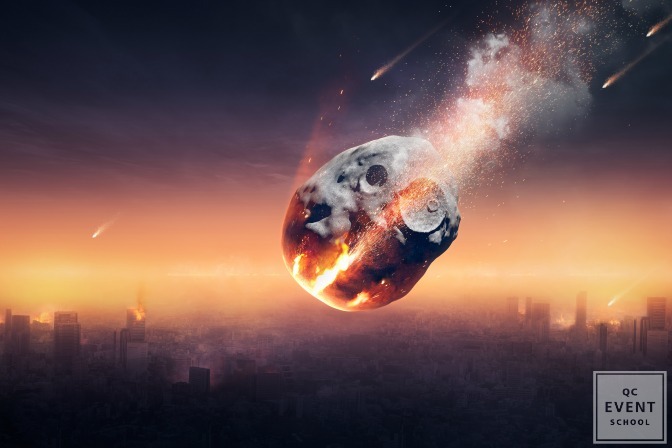 If you haven’t encountered these 9 event disasters just yet, you’re lucky! But you will, at one point or another, come face-to-face with rocky waters. Here’s what wedding and event planning schools should prepare you for! A broken zipper or a stain would normally not hurt anyone. But if you have a bride decked out in all white—you’ll going to have a hysterical bride! You’d be surprised how often this happens, so don’t be caught unprepared. If you’re hired for day-of coordination, pack an emergency kit in your car. Sometimes small changes and add-ons can get the best of us. If you aren’t keeping track of every little change along with their associated costs, you may end up blowing your budget. Documenting all decisions and changes to the timeline and budget are critical. Not only will this ensure you’re on track for every part of the planning process, but if things go wrong, you know right where to look! Once you’re a graduate, you should already have this ingrained in you. Mundane tasks are necessary, and going that extra mile separates you from the amateurs. Some toasts whether they were planned or unplanned are straight up cringe-worthy! 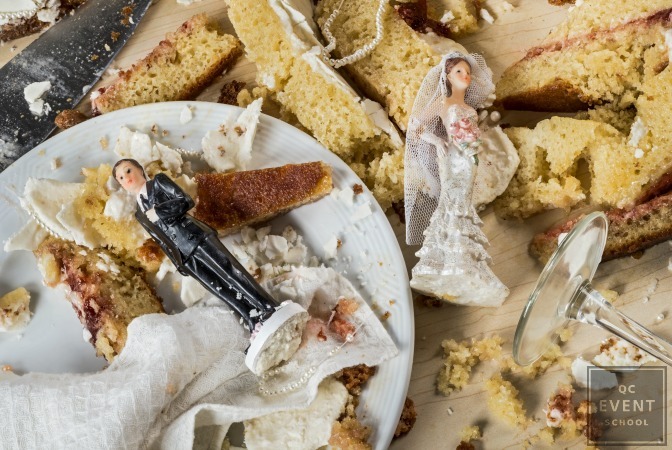 Some of the worst toasts are when the best man or the maid-of-honor roasts the bride and groom. Whoever though that inappropriate roasts are suitable substitutes for heart-felt toasts? Even worse is when drunken guests pick up the mic and try to improvise one on the spot. Learning how to approach the wedding party to keep things short and sweet and dealing with drunken guests is part of the job. It can be difficult to negotiate with them, but your course should walk you through every step! It’s easier when you have a formula to go by when dealing with messy situations! 4. A sick photographer, DJ, officiant, etc. Sometimes these things can’t be helped, but it’s not the end of the world if you’ve come prepared. An emergency backup plan should be in place if key vendors can’t make it for the big day. If you’re hiring from a professional company for your photographer or DJ, the company may have provisions to send over another person to do the job if someone falls ill. Negotiating with these vendors on behalf of your clients is difficult but it must be done! If you’re hiring independent, discuss back-up options. But most of all? Ensure all this is in the iron-clad contract! But if there’s a storm brewing? Find a company to rent a tent from or ask if indoor spaces on the property are available to use. Make sure you check out the safety capacity! It may seem a lot to juggle, but part of your job is keeping track of where everyone is. On the day of, you’re going to have to make sure everything runs smoothly and according to plan. After all, you composed the schedule! Even worse than when one half of the couple is missing? When the other half finds out! Before you alert anyone of what’s happened, track them down yourself. 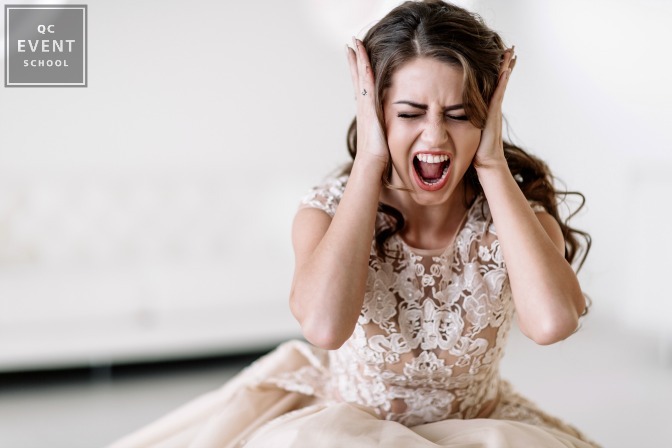 There’s no use alarming people—especially the anxious bride! Sometimes they’re just outside of the venue, seeking some quiet time right before the ceremony. Others, they’re locked in a bathroom! The bride- or groom-zilla can pounce at any moment! Just because you avoided them during the months leading up to the big day, doesn’t mean things are guaranteed to be breezy the day-of. 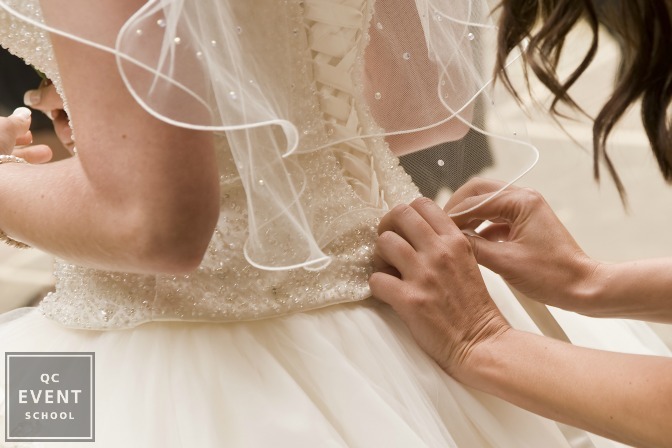 Wedding and event planning schools shouldn’t just teach you technical planning skills. Yes, knowing how to find a good deal on venues and what flowers stand up best against wilting are necessary. But being an empathetic, compassionate person is also part of the job! Weddings, unlike many other events, are emotionally significant. If you can show empathy and calm down your clients with a confident tone, you’ll avoid a lot stress, and they will, too! This is not only awkward, but it’s kind of rude! If you were planning a tight wedding, this might test you. Thankfully, you can fix this! It starts at the seating-chart planning process. No matter what your clients say, you can never ignore the possibility of extra guests. If you hired round tables, it makes it easier to slot in late additions. Rectangular and square tables are less forgiving. Always make sure catering cooks up some spare food and that you have a couple chairs and eating utensils on hand. Squeezing them up next to Aunt Marg may not have been what they wanted when they walked in. But hey, they should have RSVP’d like everyone else then! Over the course of your career, you’ll plan many happy endings. Sometimes, though, the bride and groom won’t end up walking down the aisle. It can be an emotionally grueling process for your clients, so oftentimes you’ll have to pick up the bulk of the pieces. We talk about this extensively in our other article, but here’s the gist of it: Allow your clients to settle, and take the reins yourself. You need to deal with the guests and vendors (know your contracts!). You don’t want to put anyone off—especially the vendors who you risk a good working relationship with. Professionalism is your best friend! And then after everything else is taken care of, talk to your clients. Be kind, but also make sure that you’re still compensated for all your work! Any other disasters we missed? Let us know! Spring is here! Find out QC tutor Heather Vickery’s expert advice on spring cleaning for your event planning business!